A Castlevania-inspired throwback that's 8-bit of alright. If only all stretch goals were as good as this. 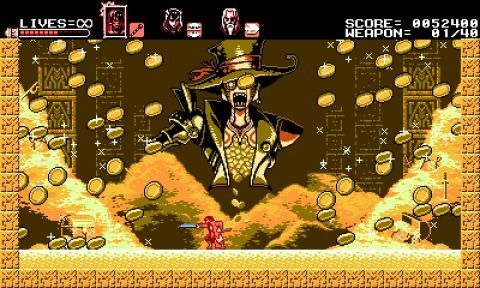 Conceived as a bonus for those who backed Koji Igarashi’s Bloodstained: Ritual of the Night on KickStarter, Curse of the Moon looks and plays like a classic 8-bit game that never existed. Inti Creates’ last involvement with the crowdfunding platform didn’t end too well, its good name tarnished by association with Keiji Inafune’s disappointing Mighty Number Nine. This, however, bears all the hallmarks of a developer determined to redeem itself. While it appears Igarashi only had a supervisory role—which almost certainly involved little more than the occasional approving nod—Curse of the Moon offers more than a passing wink to the series with which he made his name. If someone told you this was a great lost NES Castlevania game, you’d have a hard time proving otherwise. In fact, it bears more than a few similarities to one particular Castlevania game. As in Castlevania III: Dracula’s Curse, your protagonist is a fairly bog-standard warrior archetype (at least Zangetsu is a much cooler name than Trevor) joined by three other playable characters, each with unique abilities that give you fresh fighting options and open up new routes. Miriam wields a whip, jumps high and can slide under low ceilings. Arthur, an alchemist, uses powerful magic (his flame barrier is hilariously overpowered), while vampire Gebel can transform into a bat, crossing long, platform-free chasms. A key difference is that you can switch between all four at will, rather than being limited to bringing just a single ally with you. You have separate health gauges, too—essentially giving you four lives to complete a stage. It’s not the only element that makes this throwback more forgiving than the games it’s homaging. Controls are less stiff and clunky than its 8-bit peers—though you’ll still need to move back slightly from a ledge to jump up to the next. And a Casual difficulty option not only gives you infinite lives, but stops you from being pushed back when you take damage—thus avoiding the frustration of having your favourite character nudged into a void by a flying pest just before the boss screen. And when you’re facing a fork in the road and you’re not sure which path to follow, the remains of fallen adventurers will point you in the right direction, a bony arm gesturing towards the quickest route forward. All of which means even those with little experience of the classics should be able to reach the end within two hours or so. Yet quitting there leaves you with the nagging doubt that there’s plenty you’ve missed—and so it proves. Whenever you meet a new character, a flashing prompt suggests you should talk to them. Ignore it, however, and you can simply gut them with your sword, giving Zangetsu a new ability, like an arcing sword swipe, or a mid-air somersault. Or you can even blank them entirely if you fancy finish the game without any assistance whatsoever. It’s at this point you’ll grow to appreciate the artistry of the course design: these levels have been built to accommodate a range of playstyles, from those looking to revisit the games of their youth but with a more lightweight challenge to purists seeking to test themselves with only the hero’s most basic abilities. It’s much less fun that way—jabbing a short-range sword a few times before backing off and repeating can’t compare to combining all four character skills to take down a boss in double-quick time—but the option’s there for those who want it. At times, it’s old-school to a fault. Some enemies are not so much a challenge as a nuisance: the undulating flight paths of one particular enemy type combined with moving platforms and the knockbacks of Veteran mode might make you think Curse at the Moon would have been a more appropriate title. And it’s demoralising to have seemingly beaten a boss by the skin of your teeth, only for them to launch one final attack—though you’ll soon grow to expect them to come back from the dead and steel yourself accordingly. A bigger problem is that it doesn’t quite have enough new ideas of its own. Where the likes of Shovel Knight use classic games as a foundation to build upon, Inti Creates is often content to merely walk in the footsteps of those 8-bit favourites. As such, those with the deepest affection for retro games are the most likely to find it just a touch too familiar. Even so, Curse of the Moon is proof that great design doesn’t really age. For a game that originated as a nice little extra, it sets a surprisingly high bar for Igarashi and his team to clear.